Background:Infantile colic is one of the most common causes for referral to pediatric clinics. Despite different treatments, physicians and parents are still facing difficulties in handling some cases of the disease. In this report, a different treatment is introduced for infantile colic control using Iranian Traditional Medicine. Case Presentation: A two-month old male infant with severe colicky abdominal pains for 5 weeks was referred to the pediatric clinic. Colic-driven cries of the infant had begun 21 days after birth and increased gradually to 5 h a day despite therapeutic interventions so that his parents were anxious to control the disorder. In addition to previous therapies, topical chamomile oil was recommended to be rubbed rotationally on the entire infant’s abdomen three times a day. At the end of the first day of treatment, the duration of the infant’s crying decreased by about 30 min compared to the pre-treatment day. At the end of the seventh day of treatment, the duration of crying significantly reduced to 3 h within 24 h. In addition to the reduction in the infant’s crying was an increase in his sleep time at the end of the seventh day. Conclusion: It seems that the topical application of chamomile oil as a complementary approach to ameliorate and reduce infantile colic symptoms can be considered as an appropriate and safe treatment. However, more comprehensive studies on the chemical composition and effects of chamomile is necessary to further confirm these results. Infantile colic is one of the most common causes of complaints and referrals to infant clinics . Based on Wessel’s criterion, the term infantile colic is used in cases of infants who cry more than 3 h a day and more than 3 days a week with symptoms lasting over 3 weeks, if other pathological causes have been eliminated . The prevalence of this disorder in infants has been reported to be between 8 and 40% [1-3]. The exact etiology of this disorder is unknown. Some possible gastrointestinal, biological, and psychological causes have been raised in this regard. Some etiological studies considered the disorder to be linked to impaired intestinal motility and gastrointestinal spasms due to an imbalanced autonomic system . The unclear etiology and lack of an effective and safe treatment have made it difficult for physicians to deal with parents who are seeking help and guidance on infantile colic. Therapeutic interventions include eliminating bovine milk from the diet, the use of oral herbal extracts, use of intestinal contractions and anticholinergic drugs as well as behavioral interventions such as cradle song and shaking the infant [1-5]. However, these interventions are often not very effective or cause side effects in some infants. Therefore, a lot of physicians and parents are still unable to control the disorder in spite of most therapeutic interventions . 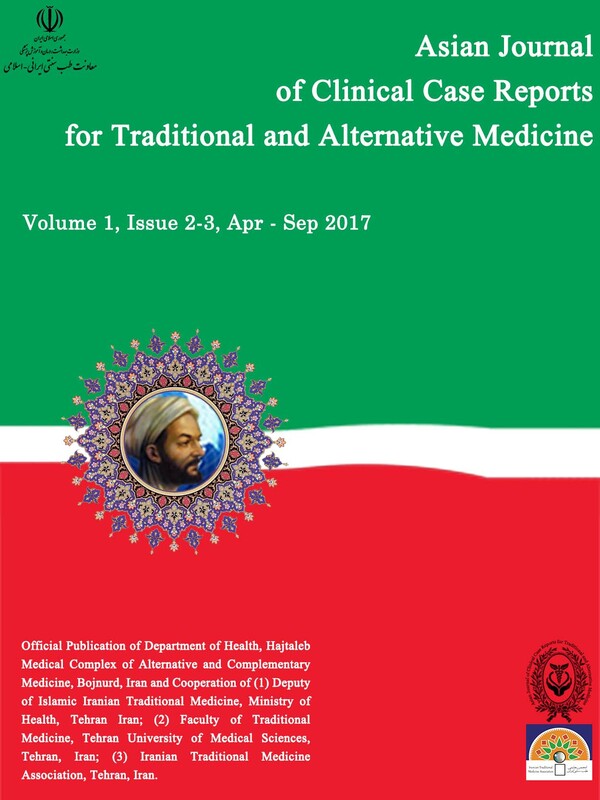 Topical treatment of gastrointestinal disorders using medicinal plants is a therapeutic approach emphasized in Iranian traditional medicine [7-8]. A two-month old male infant with severe colicky abdominal pains for 5 weeks was referred to the pediatric clinic, Sabzevar University of Medical Sciences. The infant's parents complained of the baby's continuous and intense cries. Colic-driven cries of the infant had begun 21 days after birth and increased gradually to 5 h a day and his parents found it difficult to control the disorder. Following a normal and uncomplicated parturition the infant was born with a birth weight of 3.260 kg. The infant was exclusively breastfed and was normal in examinations of growth and physical development. The infant weighed 4.950 kg upon normal physical examinations and initial tests at the time of referral. Therapeutic interventions had already been used for the infant. The mother was advised to place restrictions on dairy consumption and flatulent substances. Also, a variety of anticholinergic drugs had been administered for 3 weeks to the infant. Despite all the interventions, there was no significant improvement in the infant’s crying and the parents were not satisfied with the treatment process. The subject was a two-month old male infant with white skin and short brownish-black hair. The abdomen was slightly swollen and cold to the touch. The stool was 2 to 3 times a day with brownish and sometimes greenish appearance associated with gas excretion. The temperament of the digestive tract was inclined towards coolness and wetness, though, the overall body temperament seemed hotter. Other examinations of the infant were normal. The infant’s mother complained of stomach acid reflux and severe bloating, and was overweight (8 kg) compared to pre-pregnancy (BMI = 28). The mother was advised to avoid cold, watery, and flatulent foods. Eating measures were also trained to the mother. Parents were advised to rub chamomile oil topically on the infant’s entire abdomen twice a day in addition to previous treatments. Chamomile oil was prepared from the flowers of Matricaria chamomilla plant on the basis of sesame oil based on Iranian traditional medicine books. In order to exclude skin allergy, it was recommended that a small amount of the ointment be applied on the infant's arm and if the skin was not sensitive, to use more widely on the abdomen. The mother was trained to rub chamomile oil rotationally over the entire abdomen after breastfeeding three times a day. There was a reduction in the infant’s crying time by about 30 min at the end of the first day of intervention compared to the pre-treatment day. The decreasing trend in crying time continued into the next few days so that the infant’saverage crying time was 2 h shorter (3 h within 24 h) than the pre-treatment day at the end of the seventh day of treatment. There was also a decrease in the frequency of infant’s crying. In addition, the topical application of chamomile oil could increase the infant’s sleep duration to 58 min in 24 h. It is noteworthy that the parents were highly satisfied with the treatment procedure of the infants. The present report indicates that the topical use of chamomile oil on the abdomen of an infant with symptoms of crying, irritability, and insomnia caused by infantile colic reduced crying time during the day in the subject examined, followed by a daily increase in the duration of the infant’s sleep. Infantile colic is a common problem in infants, for which a definite cure is still unidentified due to its unknown etiology . The oral use of synthetic drugs in infancy can be associated with many side effects; however, chamomile oil accounts for a safe and low-cost gastrointestinal drug. One of the most important therapeutic consequences of chamomile oil is its beneficial effect on the digestive system. Chamomile has long been used extensively for gastrointestinal disorders throughout the world. Spasm or colic, bloating, and gastrointestinal tract inflammation are some of the disorders cured traditionally with the use of chamomile . Chamomile flowers contain two categories of hydrophilic and lipophilic compounds. Lipophilic compounds such as chimazolin, matrixin, bisabavalol and its oxides show outstanding anti-inflammatory effects. Hydrophilic compounds such as flavonoids (epinephrine zhenin) and coumarins have potent spasmolytic effects which can be generally used as anti-inflammatory agents, antispasmodics in muscle cramps, carminatives, and sedatives as treatments for infantile colic [10-11]. Since the inhibition of Camp and cGMP phosphodiesterase is a known mechanism of the spasmolytic effect of drugs, chamomile extract has an inhibitory impact on cAMP phosphodiesterase activity and also a therapeutic effect on digestive tract spasm. Chamomile is also prescribed for colicky pains in infants, menstrual pains, and uterus crampsdue to its antispasmodic properties [12-13]. Several studies have demonstrated the effect of oral chamomile on infantile colic. In this regard, Savino et al. (2005) evaluated the impacts of chamomile, fennel extract, and lemon balm on the reduction of crying time in infants and also in the treatment of colic in breastfed infants. They found that crying time in infants decreased to 85.4 and 48.9% in the intervention and control groups, respectively . Weisman et al. also examined the effects of a herbal tea containing chamomile, fennel, and licorice on infantile colic and showed a significant difference between the intervention and control groups in the number of infants waking up after colic attacks with a reduction of colic symptoms in 57% of infants in the intervention group resulting from the tea use . The present study investigated the topical use of chamomile oil to treat colic based on the principles of Iranian Traditional Medicine. Topical use and effective transfer of drugs through cutaneous penetration into the gastrointestinal tract is one of the methods emphasized for the treatment of gastrointestinal disorders in Iranian traditional medicine. From the viewpoint of traditional medicine scholars, the influence of the topical use of drugs on the digestive system is faster and less complicated compared to oral medication in some disorders . Chamomile is one of the herbs that affects the digestive system (from the perspective of Iranian Traditional Medicine) and can be effective in the control of colic by exerting its heating, lysis, and carminative properties . Recent studies also indicate that flavonoids are well absorbed through the skin and that apigenin as the most important therapeutic metabolite of chamomile has the highest rate of cutaneous absorption. Other flavonoids in chamomile such as quercetin, patuletin, and luteolin can also be absorbed through the skin to reflect their therapeutic properties . When used topically, polysaccharides display anti-inflammatory properties, which form the basis of chamomile use in wound healing . Some studies have noted the permeability of plant metabolites as well . In this regard, Cetinkaya et al. studied 40 infants of ages 2-6 weeks to evaluate the effectiveness of massage therapy using lavender oil in the treatment of infantile colic. They showed that topical massage with lavender oil has positive therapeutic effects on infantile colic . The above evidence suggests that there is potential in the use of topical drugs to treat gastrointestinal disorders. Topical application of chamomile oil to ameliorate and reduce infantile colic symptoms seems to be a proper, effective, available, and low-cost approach that is simple and easy to use for the relief and betterment of the disorder, and can easily be used on the infant’s abdomen by the mother. Another noteworthy point is that this method has no side effects in the high-risk group, that is newborns and infants as it is well tolerated. In addition to the above, other therapeutic effects such as reducing bloating and abdominal distension, preventing constipation and bowel obstruction, reducing restlessness as well as increasing the duration and quality of sleep in infants are expected owing to the systemic absorption of topical chamomile oil. Nonetheless, more comprehensive studies are needed to further confirm these results. This paper presents therapeutic approach of Dr. Hassan Salehipoor, Dr. Fereshteh Ghorat and Dr Behzad Afzali. They cooperated in maim draft of article. The final edition of the article was done by Dr Ghorat. This study is a part of the doctoral thesis of Dr. Behzad Afzali, funded by the Vice chancellor of Research at Sabzevar University of Medical Sciences. García Marqués S, Chillón Martínez R, González Zapata S, Rebollo Salas M, Jiménez Rejano JJ. Tools assessment and diagnosis to infant colic: a systematic review. Child Care Health Dev. 2017; 43(4): 481-488. Wessel MA, Cobb JC, Jackson EB, HARRIS GS, Detwiler AC. Paroxysmal fussing in infancy, sometimes called" colic". Pediatrics. 1954; 14(5): 421-35. Ghorat F, Gafarzadeh R, Jafarzadeh Esfehani R. Perinatal mortality and associated risk factors: A study in north east of Iran. Iranian Journal of Neonatology 2016; 7 (1): 47-51. 6- Klein SD, Torchetti L, Frei-Erb M, Wolf U. Usage of complementary medicine in Switzerland: results of the Swiss Health Survey 2012 and development since 2007. PloS one. 2015; 10(10):e0141985. 7- Khadem E, Shirazi M, Rahimi R, Bioos S, Ghorat F. Perception of Paralytic Ileus on Viewpoint of Avicenna. Iranian Journal of Public Health 2017; 46 (1): 150- 152. 8- Avicenna. Al Qanun Fi Al-Tibb (Arabic). Beirut: Alaalami library; 2005. 9- Ross SM. Generalized anxiety disorder (GAD): efficacy of standardized Matricaria recutita (German chamomile) extract in the treatment of generalized anxiety disorder. Holistic nursing practice. 2013;27(6):366-8. 10- Çetinkaya B, Başbakkal Z. The effectiveness of aromatherapy massage using lavender oil as a treatment for infantile colic. International journal of nursing practice. 2012;18(2):164-9. 11- Ali B, Al-Wabel NA, Shams S, Ahamad A, Khan SA, Anwar F. Essential oils used in aromatherapy: A systemic review. Asian Pacific Journal of Tropical Biomedicine. 2015; 5(8):601-611. 12- Srivastava JK, Shankar E, Gupta S. Chamomile: A herbal medicine of the past with bright future. Molecular medicine reports. 2010; 3(6):895-901. 13- Gardiner P. Complementary, holistic, and integrative medicine: chamomile. Pediatrics in Review. 2007; 28(4):16-18. 14- Savino F, Cresi F, Castagno E, Silvestro L, Oggero R. A randomized double‐blind placebo‐controlled trial of a standardized extract of Matricariae recutita, Foeniculum vulgare and Melissa officinalis (ColiMil®) in the treatment of breastfed colicky infants. Phytotherapy research. 2005;19(4):335-40. 15- Weizman Z, Alkrinawi S, Goldfarb D, Bitran C. Efficacy of herbal tea preparation in infantile colic. The Journal of pediatrics. 1993;122(4):650-2. 16- Nazem Jahan Mohammad Azam. Eksore-Azam. Teharan: Iran University of Medical Sciences, Institute of Medical History, Islamic and Complementary Medicine; 2008. 17- Aghili MH. Makhzan-al-Advia (Edited by Rahimi R, Shams Ardekani MR, Farjadmand F, eds.). Tehran: Tehran University of Medical Sciences; 2009. 18- Heilmann J, Merfort I, Hagedorn U, Lippold B. In vivo skin penetration studies of chamomile flavonoids. Planta Medica. 1993;59(S 1):A638. 19- Zargaran A, Borhani-Haghighi A, Faridi P, Daneshamouz S, Kordafshari G, Mohagheghzadeh A. Potential effect and mechanism of action of topical chamomile (Matricaria chammomila L.) oil on migraine headache: A medical hypothesis. Medical hypothese. 2014; 83(5): 566-9. 20- Çetinkaya B, Başbakkal Z. The effectiveness of aromatherapy massage using lavender oil as a treatment for infantile colic. International journal of nursing practice. 2012;18(2):164-9.